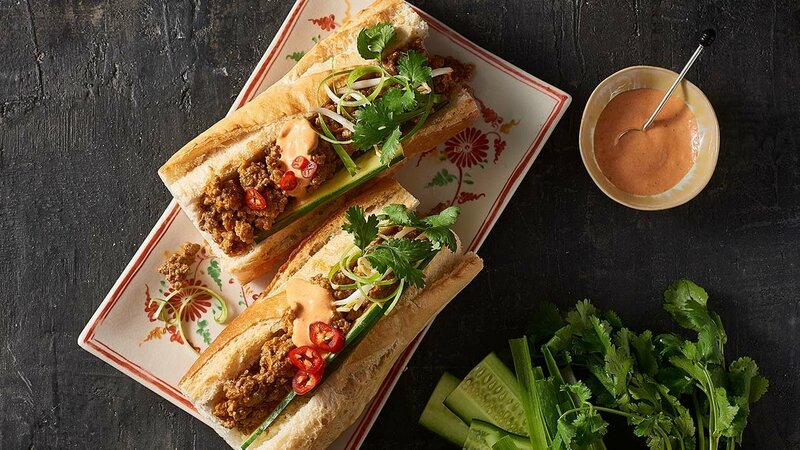 Vietnamese baguette with Red curry beef mince and salad. A suitable lunch menu item for all venues. Heat 1 tablespoon oil in a large frying pan over medium heat. Add shallot and KNORR Professional Garlic Puree and cook, stirring, until shallot begins to soften, about 3 minutes. Stir in KNORR Thai Red Curry Paste and cook, stirring, 45 seconds. Add beef and salt, breaking beef into small pieces with a wooden spoon. Cook, stirring occasionally, until beef is just cooked through, about 5 minutes. Add KNORR Coconut Milk Powder mixed with 400m warm water and sugar, reduce heat to medium-low, and cook until most of liquid is absorbed, about 8 minutes, stirring occasionally. Add KNORR Lime Powder and stir. Fill toasted buns with beef, dividing evenly.